I love teaching kids about Jesus. Getting to introduce Him to their world and see them form their thoughts about God, church, and faith is one of the things I love most about what I do. But as a children’s ministry leader, I recognize that I love doing this so much because it is what I do. I understand that even though our team is comfortable having conversations about salvation and baptism on a kid level and answering all their questions, some people just aren’t. What about the parents and grandparents who fully understand salvation and baptism for themselves but have a hard time getting on the level of a kindergartener? Or what about the parents who might still be learning this information for themselves? This month we will look at salvation discussions that can happen in the home. While we know our kids hear it at church, we want to make sure our families are also prepared to talk to and even pray with their kids. Praying a prayer of salvation with our ministry kids is amazing, but the ability to share that moment as a parent is a memory any mom or dad will treasure. We cannot experience Heaven or grace without Jesus. Despite having a basic understanding, though, even these kids need to know that we must ask to be forgiven and make a decision to commit our lives to following God. With kids I often see a lack of understanding regarding the fact that there must be a time they decided to follow Jesus. Many kids think they were born this way, since they have Christian parents and are growing up in the church. I love to ask kids when they were saved and hear about that experience. When they start with “I have always been a Christian,” I know we need to talk. One of the key moments of salvation is repentance. We must acknowledge we are sinners, and no matter how many times we go to church or how great our behavior, we must admit this before God and ask for salvation. I love to teach this with a gift. I have a kid hold it out to give it to me. Although I refuse to take the gift, I insist that it is mine and belongs to me. This helps them see that salvation is freely given to those who believe, but we must choose to accept it. The beauty in this is the ability to teach that there will be times we mess up and need to ask forgiveness. For a child who didn’t do that in the first place, this doesn’t make sense. Testimony Time: Your kids may know you to be a Christian, but have they heard your testimony? If not, share it! Maybe around a dinner table, allow one person a night to tell his or her story. Answers questions like: How did you come to know Jesus? Where were you when you prayed? Who was with you? What has God done for you since that time? And don’t forget to share the relationship you have with Him now. Kids love to know these things about their parents! Verses to Know: As we know, salvation doesn’t stop. Once we have given our lives to Jesus, we are to share that with others. It’s important that kids know that too. One way to help kids (and adults) prepare to share their faith is to equip them with the tools to do so. Here are some very important verses you can learn as a family this month to strengthen those sharing muscles: Matthew 8:8-12; Matthew 19:25-26; Romans 3:8; and Romans 10:9-10. If you find yourself in a position to lead a child to Christ, don’t overcomplicate it. Salvation is intended to be simple—as simple as ABC. Make sure they understand that they have to Admit they are a sinner and that this separates them from God; Believe that Jesus paid God’s price for their sin by dying on the cross; and Confess and repent of their sin and come to Jesus by faith. Going one more step, they should Decide to live for Him. Some kids just don’t know how to start. When you bow to pray, ask them if they want your help with the words or if they are okay praying on their own. Most kids will formulate the sweetest prayers on their own once they have a full understanding of what they need to do. And if they need help, that is okay too. I would love to hear of some great family discussions this month! I love this. This is the exact point we are at right now with our son (7). Being raised in a christian home and in church, we think he believes that he is saved because he does KNOW that he is a sinner and he KNOWS that Jesus died to save him from those sins. However, he has not quite made the connection that he has to actually ASK personally to be forgiven. It’s almost as though he thinks it just happened. We are trying to tread carefully so as not to lead him into what I would consider a salvation that is not heart-felt, but also to boldly let him know that he does have to ask to be forgiven. We are praying now for guidance to know whether we keep talking about it, but wait until he asks? Or…do we boldly approach the subject with him. He is a pleaser and wants to please so my concern is that he would do it because he thinks he needs to “please” us and not God. He is an extremely intelligent child and we don’t want to “push” him into a decision, but we also don’t want to be the stumbling block or hindrance to his salvation…it’s too important. Also Romans 3:8 I might be missing what the author is trying to teach regarding sharing? Hi… I was raised in a christian home but later lost my way… God started working with me several months ago, calling me back, for which I am eternally grateful. My husband, though believing that Jesus exists and goes to church, is still very much enthralled and distracted by worldly things. I pray for him and try to lead by example, however feel like I am the only one who in our home truly understanding the gravity of being a born again christian. My son is four years old and has been attending church and Sunday school for a few months. He still do not understand who God is, Jesus is and where our world comes from. I don’t know how to get him to understand. He is very easily distracted and at times seem as if he doesn’t understand when we talk to him however his teacher calls him super intelligent and a little genius…. I pray for him but I am at a loss at how to get through to him. Any advice would be accepted gratefully. Our hearts go out to you because what you have described also fits a number of of other new families. You are not alone. But, your job as a wife and mom is a bit harder. Here is some good news, your husband is not antagonistic and sending opposite messages to your son. This makes it easier on you but at times may be more confusing to your son who will not understand why dad who seems to be a believer is not invested in God, family, and church at the same level you are. I would coach you in the following ways. 1) Never be negative about daddy in front of your son. Do not put him down or talk negatively about him in front of your son (or anyone else for that matter). You cannot win your husband over to a closer intimate relationship with God or yourself by criticism. However, as your son grows older he will have questions about why your values are different (if things do not change) and you will have to show honor and respect and teach him how to do the same while answering honestly and openly. Discuss your son’s questions with your husband. 2) Love your husband with all your heart and daily seek to be his best friend. This will place in the best possible position to influence him. 3) Spend regular reading time with your son. This builds a relationship while helping him explore various fun adventures. 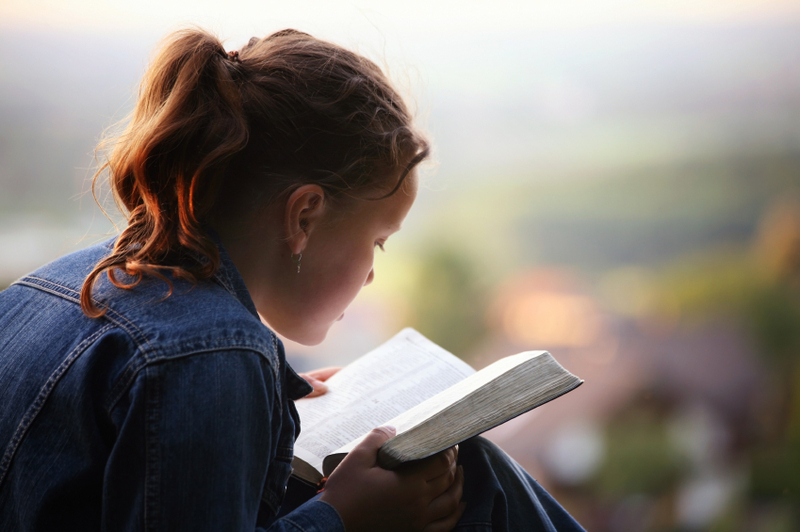 Mix up the books (one of my childhood favorites was Charlotte’s Web) but even at this time establish a daily reading that would be devotional. We have some earlier Bible story reader books that would be fun. (Let us send you a complimentary copy). 4) You continue to dig into topics that would help you answer those questions that will come from your intelligent son. He will ask some tough ones and with an ambivalent dad, you will need to be the guide here. In Christianity, you are probably aware this area of study and reading is called apologetics. It will help you answer the tougher questions. And make sure you also can answer with, “I am not sure but we can find out together” and then include your son in the discovery process.